Fresh winds prevailed on the second day of the German Laser Europacup Round in Warnemünde. Theodor Bauer GER has taken a smashing lead in the Lasers Standard with two race wins. Sergey Komissarov RUS is already 20 points behind. Jakub Rodziewicz POL and Eliot Merceron FRA share the 3rd place. 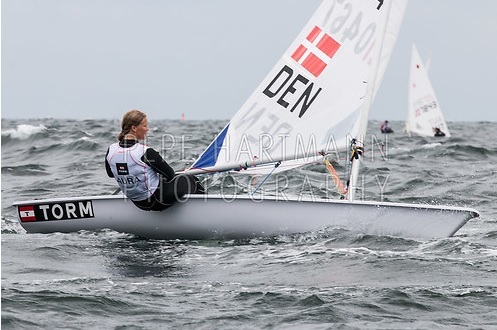 The past World Champion Anne-Marie Rindom DEN won both heats in the Radial-Girls and leads overall ahead of Hanna Anderssohn GER and Pia Kuhlmann GER at equal points. In the Radial-Boys, Federico Tocchi ITA defended the first position in front of Daniil Krutskikh RUS new on rank 2. With another race win, Joshua Richner SUI has taken the lead in the Lasers 4.7 and is at the same time leader int U16 rankings.